When I was about 5 years old, and living in a small red house in East Walpole, my father built an amazing outside play area for my sister and I. The fenced in space was about 20’ X 30’ and contained a wonderful wooden sandbox, of which the one in this show is a replica. 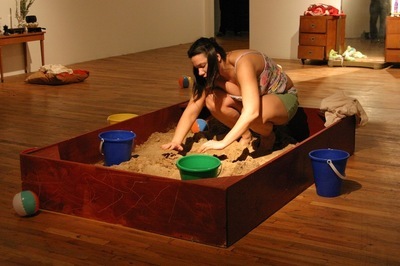 In Sandbox, I play in my sandbox, building a heart-shaped sandcastle around myself, while the sounds of me singing “You are my sunshine…” and chanting “Miss Marni. Miss Marni. Miss Marni…” increase in intensity in the background.